Interest rates are on the rise, and that means bond prices will decline. 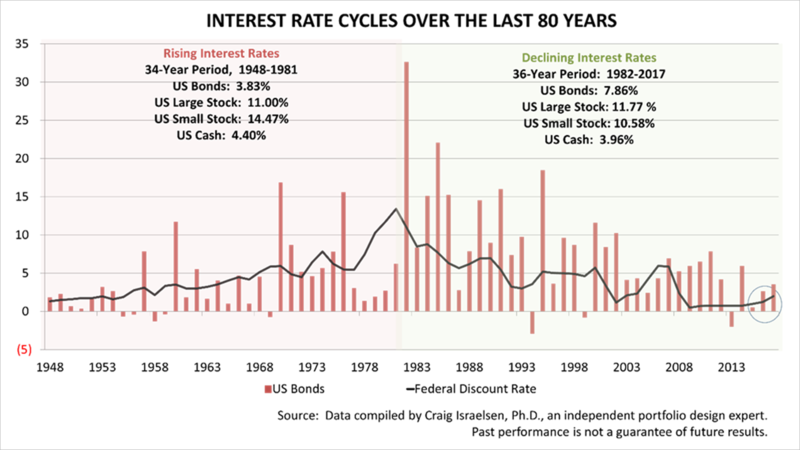 Here's a summary of financial history since World War II demonstrating how long interest rate cycles last and how it is likely to affect you. From the end of World War II to 1981, interest rates rose, as is shown in the black line in the chart. Of course, when interest rates rise, bonds prices fall because bonds paying less than the new, higher rate are less desirable and their prices adjust downward. 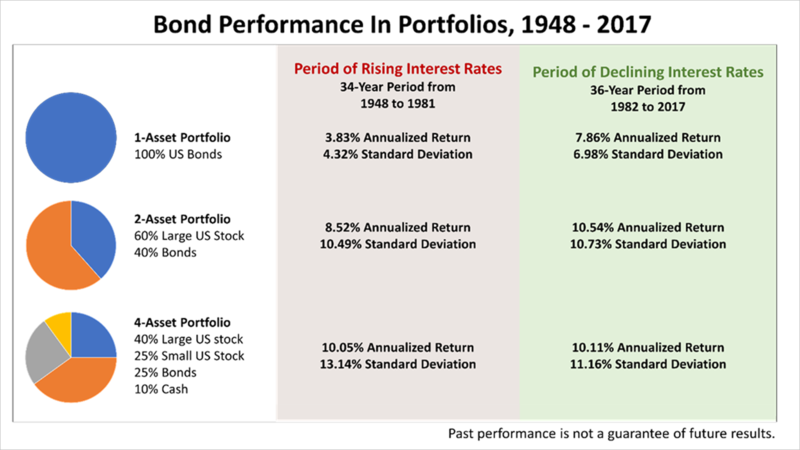 Thus, from 1948 to 1981, the average annual return on bonds was just 3.83% annually. Now look at what happened since the declining rate cycle began in 1982 through the end of 2017. As interest rates moved lower, the prices of bonds climbed. Bonds returned an annual average of 7.86%, for this 36-year period. Which brings us to where we are today. Interest rates started moving up about two years ago, which means bond holdings declined in value. The Federal Reserve, which controls short-term rates - the black line - will continue to push rates higher for many years, if history is a guide. In fact, amid the strengthening economy, the Fed says it expects to ratchet rates higher again and again in 2018. For investors who, over three decades, have grown accustomed to bonds appreciating at a rate rivalling stocks, the future seems likely to be very different, which especially affects the demographic bubble of baby-boomer retirees, who have long favored bonds for producing reliable income. To understand the effect the new rising rate cycle might have on your portfolio in the years ahead, this table gives you the key facts. The 11% annual return on stocks and the return of about 4% on Treasury Bills stayed approximately the same through both the rising and falling interest rate cycles. However, the 3.8% average annual return on bonds in the rising rate cycle from 1948 to 1981 was less than half the 7.86% annually averaged on bonds during the 1982 to 2017 period. This poses a new kind of risk that many investors have never experienced before. During the rising rate cycle, when the average annual return on bonds was a measly 3.83%, stocks and 90-day Treasury Bills averaged about the same annual return as they did in the falling rate cycle. The performance of stocks, bonds, and cash over this period demonstrates why diversification and a strategic approach are so important to long-term investing. Shorter maturity bonds - due in three- to seven-years, as opposed to 10, 20, or 30 - are less susceptible to interest rate risk than longer maturity bonds with more years to run paying your interest before returning your principal. These illustrations do not reflect the impact of inflation, which adds another dimension and requires a separate discussion. The takeaway here is that rates may be at the start in a new long-term cycle and clients can rely on our advice on the best way to manage this risk. Please do not hesitate to contact us with questions. Large-cap US equity represented by the S&P 500 Index. Small-cap US equity represented by the Ibbotson Small Companies Index from 1970-1978, and the Russell 2000 Index starting in 1979. Non-US equity represented by the MSCI EAFE Index. Real estate represented by the NAREIT Index from 1970-1977 and the Dow Jones US Select REIT Index starting in 1978. Commodities represented by the Goldman Sachs Commodities Index (GSCI). As of February 6, 2007, the GSCI became the S&P GSCI Commodity Index. U.S. Aggregate Bonds represented by the Ibbotson Intermediate Term Bond Index from 1970-75 and the Barclays Capital Aggregate Bond index starting in 1976. Cash represented by 3-month Treasury Bills.